Elizabeth Wilkerson graduated with a Bachelor of Arts from the University of South Carolina in 2010. She went on to earn her Juris Doctor degree from the Charleston School of Law where she was Senior Articles Editor of the Federal Courts Law Review and served as President of the Public Interest Legal Society. She returned to Columbia during her final year and completed law school at the University of South Carolina School of Law. Prior to attending law school, Elizabeth worked in Washington, D.C., for two years for a lobbying firm where she gained experience in the federal legislative and administrative processes. While there, she also organized events for state and national political leaders. 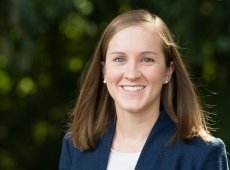 Before joining Clawson and Staubes, Elizabeth served as judicial law clerk to South Carolina Circuit Court and Business Court Judge Clifton Newman. As a judicial law clerk, she was able to see inside of the decision-making processes of both the judge and jury, as well as witness numerous trials from beginning to end. Her practice areas now focus on civil litigation and insurance defense. She primarily works with insurance companies to defend insured individuals and businesses. Elizabeth lives in Columbia with her husband, Allen, and their dog, Reagan. She enjoys running, traveling, boating, and attending local sporting events.